So … who are we? We’re a friendly club that trains in Greco-Roman/freestyle wrestling and submission grappling (submission wrestling). We originated in London, but now hold our regular practice sessions in Brighton. Our club is a close knit friendly community underpinned by open and honest friendship between all our members. Our mission is to promote the close combat sport of wrestling amongst enthusiasts. Everyone is very welcome to join us irrespective of gender, race, religion or sexuality. Our philosophy of equality is strongly ingrained in all of us. Jek, our founding member runs and organises the club. LAW is always prepared to assist any collection of wrestling enthusiasts organise themselves. Our club practices both Olympic (Freestyle & Greco-Roman) and grappling (submission) wrestling. 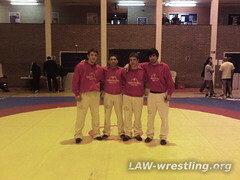 Our practice sessions operate on a full wrestling training programme. Our practice sessions are for members and guests only – no chance callers. How are we regulated and how are our coaches accredited? LAW is affiliated to the British Combat Association (BCA) and is also a member of WWB and the EGLSF, Europe for Olympic wrestling. LAW has been accredited by the BCA to run and qualify individuals to become a Coach in the close combat sport of Grappling up to the level of Club Coach, insured by the BCA to run their own grappling club/school.